What to do with breasts. Specifically chicken ones. I used to avoid buying boneless, skinless breasts unless I was making chicken cutlets. 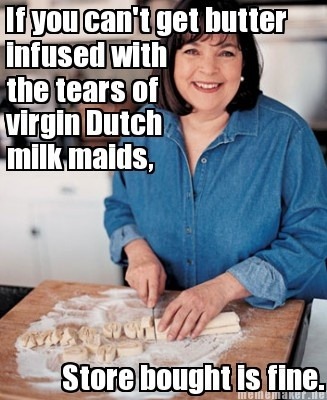 I never knew how to cook them without them being dry and boring. However, in my efforts to save a few bucks, I’ve been buying big packs of them, so I had to find some tasty ways to use them. Good news…I found some! Caprese Chicken – I found this one on Pinterest and I love it because it has a ton of flavor and requires very little prep or chopping. I shave two or three minutes off the cooking time on the chicken and use regular mozzarella instead of buffalo because I’m strange and don’t like buffalo mozzarella. 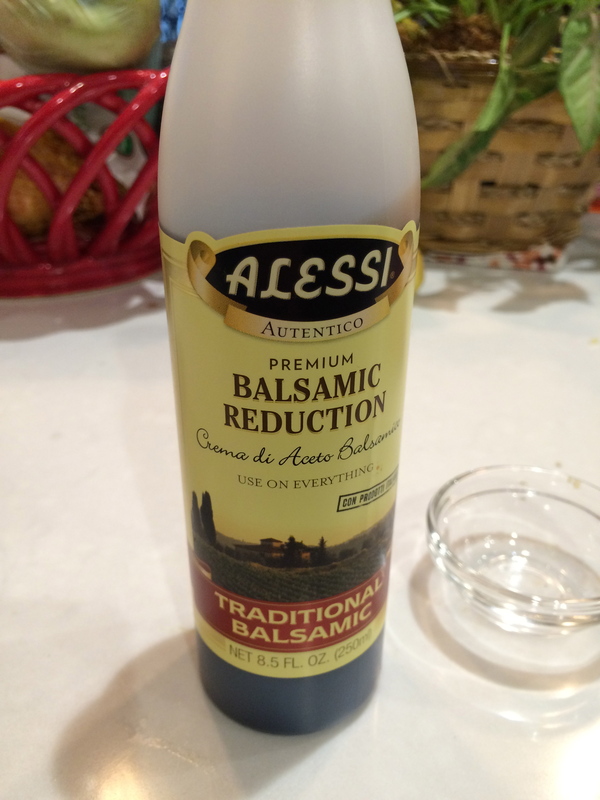 On a whim, I bought this Balsamic Reduction glaze and it’s so good. The caprese chicken is perfectly delicious with regular balsamic vinegar, but when you can drizzle this sweet syrup on it, why wouldn’t you?? One-Pan Chicken Burrito Bowl – Here’s another one I found on Pinterest. I loved it so much that I think I made it three times in the month after I found it. As the title indicates, you only use one pan, which makes clean up easy IF you don’t use heat that’s too high. The second time I made this I guess I left it simmering a bit too high and there was a whole layer of cooked rice stuck to the bottom of the pan. Ugh. The other change I make to this recipe is that I swap out the can of diced tomatoes for a jar (or really three quarters of a jar) of salsa. It adds some extra flavors and with the huge variety of salsas on the market, you can really customize the recipe based on your taste. Chicken Chili – This one comes from Dinner: A Love Story (a great place for solid recipes) and it’s another fast and easy one. When I read through the recipe for the first time, I saw four tablespoons of chili powder and thought, “whoa! That’s a lot of heat.” I like a little spice but not too much. To be safe I used two tablespoons and I thought that was plenty of heat. 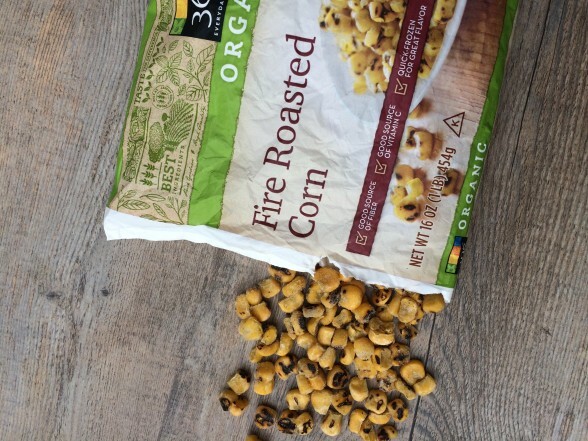 I had serendipitously just bought Whole Foods Organic Fire Roasted Corn and it was PERFECT in this recipe. Obviously regular frozen corn is fine too, but the flavor from charred corn was delicious and added zero extra work. If you don’t have a Whole Foods nearby, I’m pretty sure Trader Joe’s carries a similar product. 5 Ingredient White Chicken Chili – yet another Pinterest find! It’s really more of a soup than a chili and it’s so fast and easy that I felt guilty just pouring everything in the pot and saying, “Ok, I made dinner!” The secret to this recipe is salsa verde. If you’ve never had it, it’s a very mild salsa and it’s delicious. The base of the soup is only the salsa verde, chicken, chicken stock, cumin, and Great Northern Beans but then you can add so many delicious toppings at the end. I like cilantro, avocado, sour cream, cheddar, and broken up tortilla chips. Do you have any go-to recipes for chicken breasts?